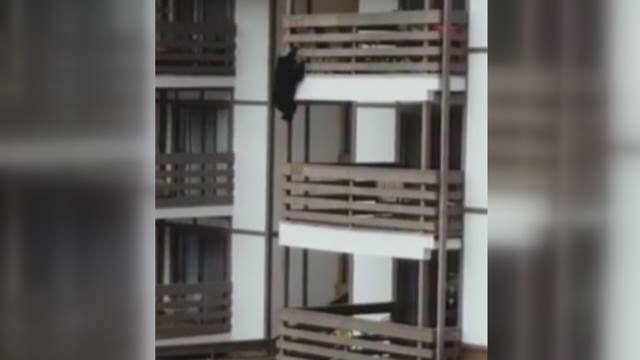 (WBIR - Sevier County) In one of the oddest bear sightings in recent memory, some Gatlinburg residents found a bear climbing its way up their condo building. It was around 7 a.m. earlier this week when Thelma Bundren's friends who were staying at her condo called her to come outside. That's when she saw a bear climbing up a nearby condo building. Her friends began recording the surprising sight as the bear climbed back down from a third floor balcony. Despite living in Gatlinburg for the past 15 years, Bundren said she's never seen anything like this. She thinks the bear might have started its climb because it smelled garbage sitting on one of the balconies. She said the bear came back later that evening looking around again. Bundren said she called Gatlinburg city officials to get a hold of wildlife officials. Wednesday on 10News at 5 p.m., a TWRA official will explain the craziest bear sightings they've experienced and have a safety reminder about what to do when bears come around.